Sit back, relax and listen to your favourite book! Tune in to an exciting crime story during a long car journey! 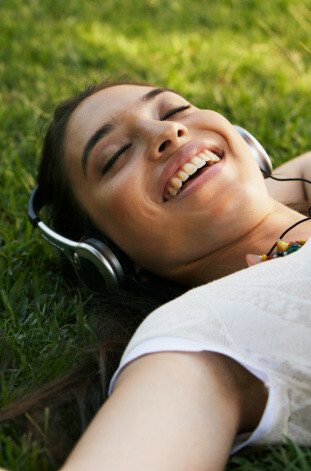 Discover how listening to audiobooks helps you expand your vocabulary and improve your feel for the language! Browse through our large and diverse selection of free audio books! A huge number of popular books and poems in French can be found in high-quality on this website. The audio files are also available for download at no cost. You can improve your listening skills on this website by exploring the huge library of free French audio books and poems. With over 4000 free audio books, this website presents an excellent opportunity to learn French casually. Choose from a number of popular authors and books. Categorised by topic (Poems, Religion, Philosophy, Theatre …), here you can find a number of high-quality audio books from famous French authors. This site contains famous stories of French literature, including many audio recordings (such as "The Little Prince"). The loudspeaker symbol indicates that an audio version of the text is available. Discover the wonderful combination of reading and learning French – made flexible and easy with E-Books!